Brittani Beeso, 23, of Worcester purchased marijuana at the opening of Cultivate, one of the state&apos;s first two pot shops, in Leicester on Nov. 19. Government leaders throughout Massachusetts envisioned dollar signs when marijuana legalization passed. Taxes would help fund the subway, police, and schools. But because of the slow rollout of pot stores and their far-flung locations, tax revenues have been disappointing so far. The state projected it would reap $63 million in taxes by June 30, but had received only $5.9 million as of March 1. The projection assumed “a reasonable number” of stores would be open last July, Revenue Commissioner Christopher Harding said in 2017. Instead, the first shops opened in late November, four months later. “The numbers are low, but it’s too early in the birthing of this particular industry to be able to actually calculate whether we’re on or off track for our revenues,” Administration and Finance Secretary Michael Heffernan said at a budget hearing this month. Three months into recreational pot sales, Massachusetts had nine stores open that had sold $45 million worth of marijuana, or about $6.60 per resident. That’s less than in Nevada, Colorado, and California, where $30, $8.70, and $8.17 were sold per person in their first three months, according to a Globe analysis of sales data. Those states allowed stores to open far more quickly — Colorado had 181 shops licensed three months in — with locations near tourism and population hubs such as Denver, San Francisco, and Las Vegas. Meanwhile, Greater Boston still has no stores. The first is slated to open Saturday in Brookline. Industry analysts say Massachusetts has a much slower local approval process and a more complex system to navigate than other states, where medical marijuana dispensaries were allowed a simpler process to begin nonmedical sales. The underwhelming tax revenues have thrown into question the state’s projection of $133 million for fiscal year 2020, which starts July 1. The Massachusetts Cannabis Control Commission, which licenses marijuana businesses only after they have been approved by towns or cities, said it was “comfortable” with its pace and priorities. Had it rushed the rollout, the commission said, there could have been “more serious costs” than uncollected tax revenues, such as easy access for children, diversion of products into the illicit market, and criminal groups infiltrating the industry. “The commission has placed a premium on the build-out of a complete adult-use regulatory structure that supports public health and public safety,” a spokeswoman said, adding “the measured pace” ensured that stores passed inspections, sold lab-tested products, hired vetted workers, and tracked their products. Industry analysts say that sales here have been inflated by the number of sole-purpose tourists who have flooded the first legalized pot shops on the East Coast. While Massachusetts lags behind California, Colorado, and Nevada, it has sold three times more than Washington did. On Monday evening, dozens of people — many from New Hampshire — waited in an hour-long line at Patriot Care, a new marijuana store that just opened in Lowell. Massachusetts imposes a 17 percent tax — a 6.25 percent sales tax plus a 10.75 percent excise tax — and local governments 3 percent, for a total of 20 percent. So far, the taxes that have been collected were put into several buckets: nearly $2 million into the state’s general fund that pays for salaries; $350,000 for the Massachusetts Bay Transportation Authority; and nearly $300,000 for the School Modernization Fund. Another $3.2 million went to the Marijuana Regulation Fund, which pays for the cannabis commission, pesticide regulation, the state’s social equity program, public health, police training, and substance abuse prevention. Local governments in towns and cities where pot stores are located have collected $885,000 in taxes. They also will receive an annual fee of up to 3 percent of their stores’ revenues as part of their agreement to host the businesses. In Leicester, where one of the state’s first shops opened to massive traffic snarls, town leaders plan to spend the influx of cash on new police cars, fire trucks, ambulances, and school equipment. Policy makers may be tempted to raise cannabis taxes to fund better public services, but they must balance those needs with avoiding prices rising so high that consumers keep buying from their dealers. To maximize taxes, the government needs consumers to migrate to the legal market, said Andrew Livingston, director of economics and research at Vicente Sederberg, a cannabis law firm. Some 75 percent of the pot sold in the state this year will be under the table, according to BDS Analytics, a cannabis market research firm. 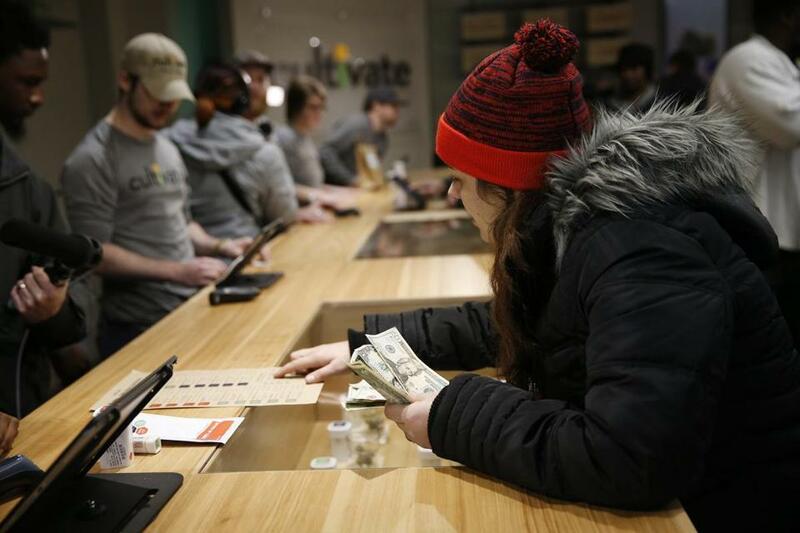 Several Boston-area marijuana consumers said last month that they would love to buy legal pot, but would wait until the shops could better compete with their dealers on price and convenience. “If you ask the average Massachusetts cannabis consumer where they’re buying, they won’t say, ‘I’m going to my local store,’ because there is no local store,” Livingston said. While bringing consumers out of the shadows is important, cannabis commission chairman Steven Hoffman has said going slow allows the state to work toward its legal mandate of ensuring participation in the industry by small businesses, minorities, women, and people who were disproportionately harmed by the war on drugs. Pollock, the cannabis store CEO, agreed with the commission’s pace. He said the state doesn’t have enough marijuana to grow the industry too fast, and rushing could lead to a lack of inspections, which could enable bad actors. Pollock said that people upset with the slow process and the locations of stores should direct that frustration to their local officials, who have more power than the state in determining where the first stores open. Pollock acknowledged, though, that Massachusetts’ sales would suffer if other states open their own stores. Maine and Vermont, which have legalized pot, are determining whether and how to roll out retailers. New York, New Jersey, Connecticut, and Rhode Island are considering legalization measures now.